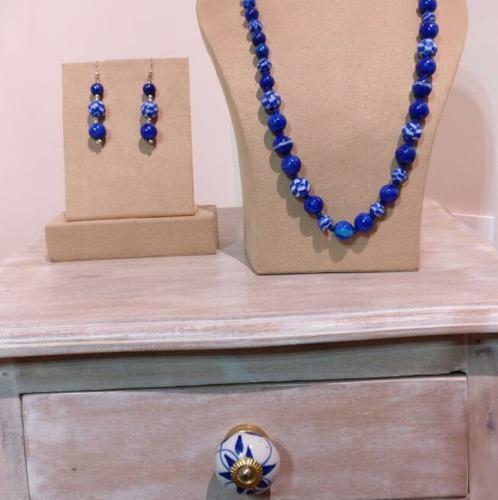 our products Blue Pottery Designer Jewelry or giving offers on our listing is solely your risk. Many of our customers faced skin problems, marks and rashes by ordering jewellery from these fake sellers and they reported this matter to us. Ambika Designs is the authentic and trusted brand for jewellery worldwide. Please beware. At Neelofar's, it's all about a passionate entrepreneur, who has ventured into a lesser frequented territory of Artisans and Craftsmen, from remote hamlets of Rajasthan and several other states of India. Our fashion Jewellery is one of its kinds with exotic designs- trendy yet eternal, when it comes to style. Neelofar's Home Decor range varies from Jaipur Blue Pottery artifacts to textile designing to paper- mache articles- all handmade yet intricate with perfect finish. To spice up the wardrobe of Fashionista, we have plethora of collections of sarees and other ethnic attires. Our vast range of 'Mojaries' are known for their style and creative designs, world over. Neelofar's is a rapidly expanding firm. The name carries with it an unflinching assurance and trust that stems out of our rock solid working ethos.